TORONTO, Sept. 6, 2016 /CNW/ - Brace yourselves Canadian chip lovers! For the first time ever, Canadians will have the chance to enjoy the savoury Chalet sauce they love on the country's favourite potato chips. Lay's and Swiss Chalet have partnered to bring Canadians a truly Canadian delicacy, Lay's Chalet Sauce potato chips. "Lay's is constantly in pursuit of new flavours to excite Canadian chip lovers and Lay's Chalet Sauce potato chips are no different," says Shereen Yasseen, Senior Director of Marketing - Frito-Lay Core & Global Brands, PepsiCo Foods Canada. "This creation combines a classic Canadian flavour with Canada's favourite potato chips made from homegrown potatoes, giving our fans a new way to enjoy a taste they love." Swiss Chalet's secret recipe sauce has been a staple with Canadian families since 1954, developing a cult like following where Canadians will do just about anything for (and with) the signature dipping sauce – drink it with a straw, swim in it, even bathe in it. 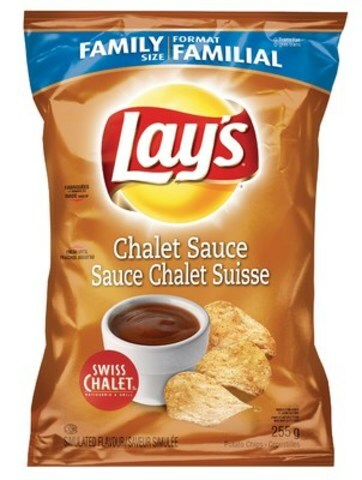 It was this fanatical love of the sauce that inspired Lay's and Swiss Chalet to create the most Canadian chip ever. "Partnering with Lay's was a natural extension for our brand," says Lindsay Robinson, Director of Marketing – Swiss Chalet, Cara Operations Limited. "We pride ourselves on being Canadian, from our 62 year food print, to our product quality story and heritage, and our friendly "home away from home" service. This uniquely Canadian potato chip was the perfect way to bring two iconic Canadian flavours to the masses in a new and exciting way." Canadian Chalet sauce lovers need to mark their calendars. Beginning September 2016, Lay's Chalet Sauce potato chips are only available in-restaurant at participating Swiss Chalet restaurants while quantities last. The potato chips will be available in 255g bags and 40g bags. Swiss Chalet® is all about real food made fresh daily by real people. That's why we've been a Canadian favourite since our doors first opened way back in 1954. We're known for our fresh, never frozen Canadian rotisserie chicken, and our fresh-cut daily fries. We're also known for our Signature Chalet Dipping Sauce that is simmered to perfection every day. Whether it's in the dining room, take-out, or delivery, we at Swiss Chalet® are committed to providing high quality food with home-style Canadian service.